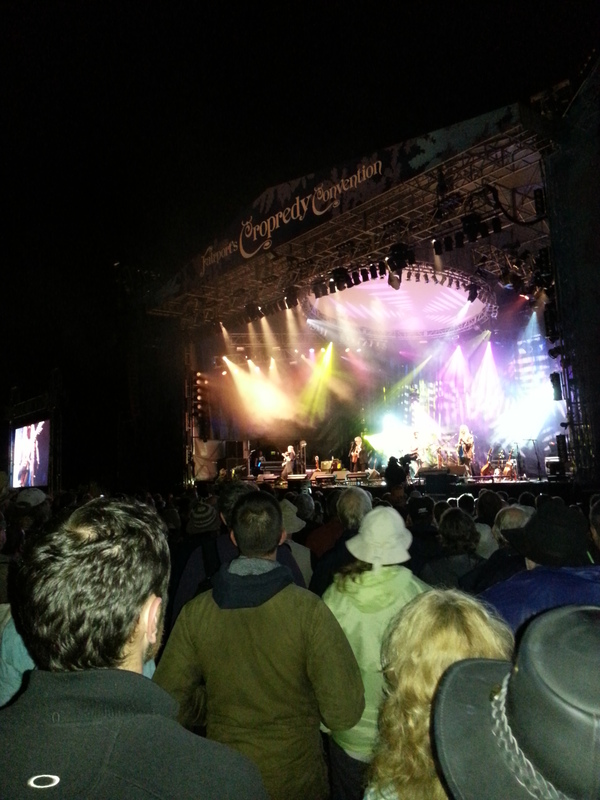 “This soul-restoring festival” is how one of our number described his experience of Cropredy 2014. 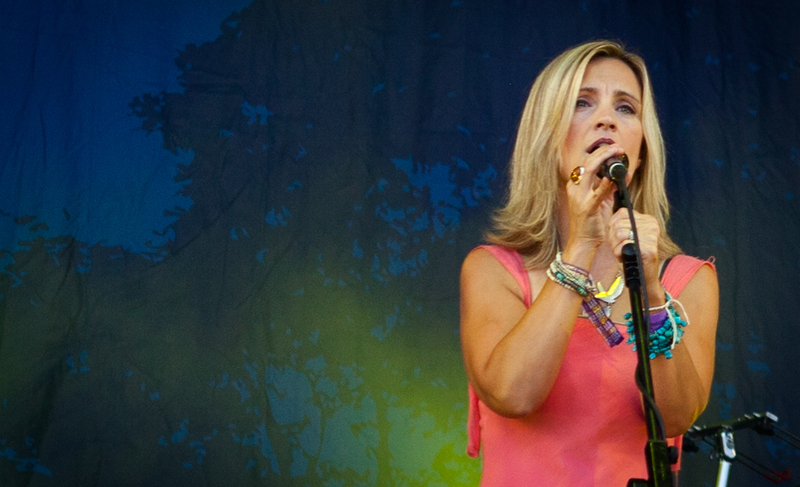 And soul-restoring is certainly a description that can be applied to Cara Dillon’s performance. 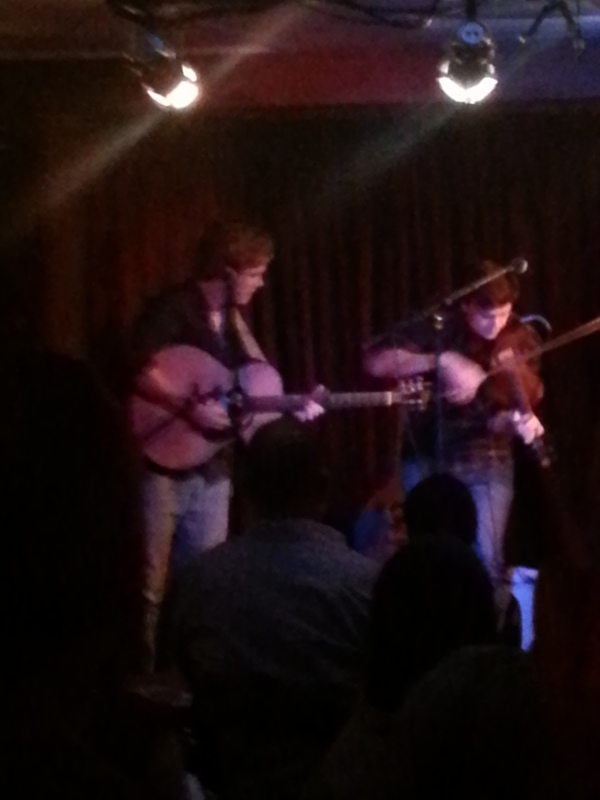 Irish folk singer, Dillon, has been scooping up music awards for over a decade now and it’s not difficult to see why. Her elegant, crystal clear vocals are backed by a talented band of musicians, including husband Sam Lakeman on piano. Her new album, A Thousand Hearts, has been attracting rave reviews and songs from it featured prominently in the set. She and the band perform a mixture of traditional and contemporary material, with Child ballads like Bright Morning Star being performed alongside songs like River Run, a song from a ’90s indie band that Dillon performs a stunning version of, accompanied only by Lakeman on piano. Even with folk standards as familiar as “As I Roved Out” she applies calm beauty of the Cara treatment and makes the songs truly her own. 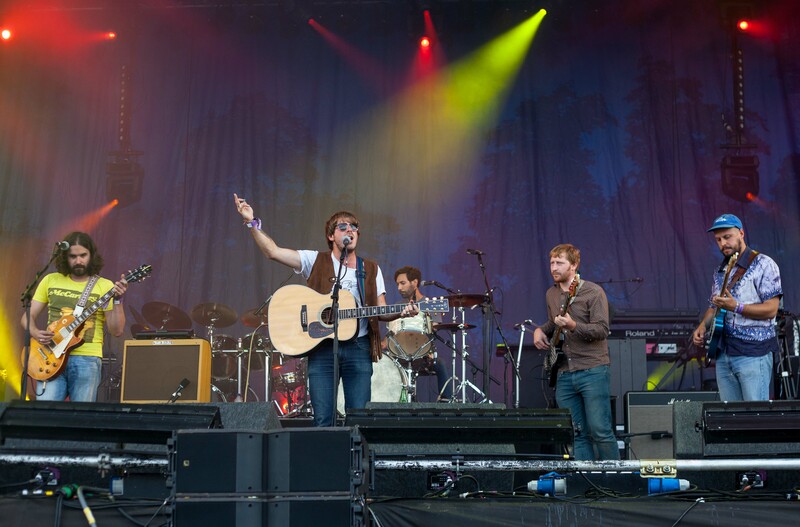 This was indeed a soul-restoring performance and one of the highlights of Cropredy 2014. Formed in London in 2009, the band’s influences are not The Kinks or The Small Faces or the Clash but rather the laid-back West Coast rock of bands like Crosby Stills Nash & Young. They are a young original band for the 21st century but one who carry that influence and musical heritage so well. And for sixty minutes or so those of us at the front were no longer in rural Oxfordshire in 2014 but transported back to Woodstock in ‘69. Treetop Flyers (named after a Stephen Stills song) have perfected their sound and they do it beautifully. From Morrison’s expressive vocals, to the laid back harmonies, the countrified electric guitar licks, the melodic strumming of the acoustic guitar and the infectious boogie, they do sound good. And they’ve got a great collection of self-written songs, too. Rose is in the Yard, Things Will Change and Is it All Worth It are especially worth hearing and lapped up by the crowd, as was there cover of Creedence Clearwater Revival’s Proud Mary which fitted the mood of the set perfectly. Still only one album in, 2013’s The Mountain Moves, I’m expecting to hear some truly classic material from this band over the coming years. In the meantime they are a great live band – catch them at a festival or venue near you. Blackbeard’s Tea Party, a young band from York, play a fantastically lively kind of folk. Fun, loud and with bags of energy I’ve seen them go down particularly well as a late night attraction in far smaller venues. But how would they fare on a Saturday lunchtime playing to an audience of 20,000, which as lead vocalist, Stuart Giddens, told the crowd is at least ten times the size of anything they’ve played to before? Well, the Cropredy audience responded brilliantly and they went down a storm. Proof of that was the massive queue for the band’s CD signing session after their set, which snaked around the festival. And when the Tea Partiers over-ran their scheduled signing slot they, along with their queue of newly-enraptured fans, decamped to a spot by the bins where they carried on meeting, greeting and signing throughout the afternoon. Although they are now seasoned festival performers and this year played one of the small stages at Glastonbury, I hope that reaching this many people is the start of something bigger for them. The combination of loud electric guitar and pumping bass lines, together with manic but beautiful fiddle sounds from Laura Boston-Barber, creates a hugely energetic brand of modern folk-rock. Stuart Giddens, who jumps up and down like the campest boy-band wannabe but has a commanding and powerful voice, is a perfect fit for the band. His vocals and his infectiously enthusiastic stage presence have really brought something to the band. They played a number of songs from their latest album, 2013’s “Whip Jamboree” as well as material from their two previous albums, recorded before Giddens joined. A particular favourite of mine was the traditional song, Landlord, an epic tale of drinking drunkenness, which for some bizarre reason I remember being taught at primary school and still remember all the words. Mid-70s education was so much fun at times. 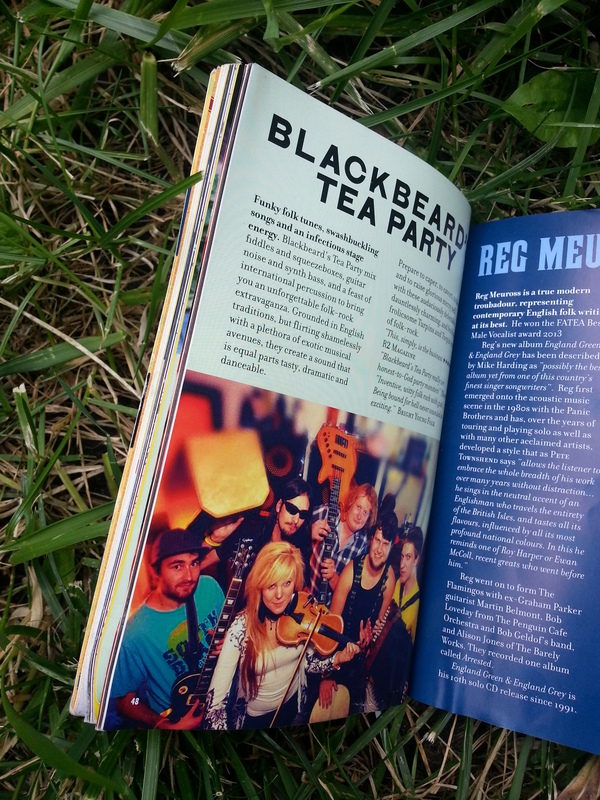 A talented and hugely fun band with a great sound, Blackbeard’s Tea Party deserve to go far.